Police have rejected allegations that they have acted improperly in their investigation of a bashing of two boys earlier this month. A spokesman says: “Police conducted a thorough investigation regarding this matter, resulting in two males aged 21 and 27, being arrested and charged. “As these matters are now before the courts, police are unable to comment further. The allegations were made in a media release from the Shut Youth Prisons group this morning. Lets take a deep breath and wait to see what the court determines and whether the link with social media exists as has been suggested. I doubt that this will occur as it does not suit the agenda. Violence breeds violence, we only have to walk around the streets of our community to see this in action. Trying to segregate the community on the basis of race hate does not bode well for the future of our town. Choice determines actions not the colour of skin or nationality or ones perception of such. Frank G, you do realise that there are similar facebook pages in most towns around the country that are as bad, if not worse than ASCOF. Are you saying that if a Facebook page was moderated better, youth crime would not exist? These vigilante attacks are wrong, but blaming the admins of a Facebook page is wrong as well. Nowhere in the ASCOF page did I read that these groups should be formed, what I did see was a lot of frustration by people who feel unsafe to out at night, businesses closing down due to non stop vandalism, people leaving town becaus of social issues, home invasions, theft, insolence on the street. Maybe look at the cause of the issue, not how people react to it. ASCOF is a place for people to vent their frustrations, and vent they do! Sometimes it is better to get your issues out and talk about them rather than bottle them up inside, ASCOF allows people to do that, sometimes it goes a bit over the top, but that is why it is called an OPEN forum. To make the connection between people winging on a Facebook site and the brutal bashing of two kids is laughable. The NT Government is more than capable of maintaining anonymity of offending juveniles while also providing detailed reports about the events and the responses. Is NTG providing such adequate reports? When are the forum moderators of the Alice Springs Community Open Forum going to take responsibility for what they have created? 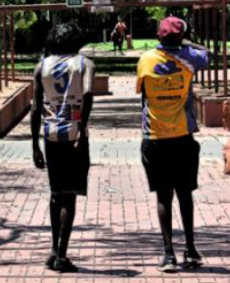 Unfortunately this is what it has come down to as people in Alice Springs are sick and tired of the lack of progress from the NT Government and soft punishment for juvenile criminals. It was only a matter of time before something like this occurred and we are lucky on the other hand that no one has been killed by the rock throwers around town either. The police are caught between a rock and a hard place and all they can do is keep picking the kids up off the street, watch them go through the courts, get a slap on the wrist and straight back out again … where are the parents, where are the Aboriginal organisations and last but not least, where is Mr Gunner? This is no surprise the way people whip each other up on social media directing their anger towards youth of this town. Violence is not the answer.